We just recovered a very, mysterious, Chevrolet Blazer at the Springfield Canal sitting in seven feet of water. 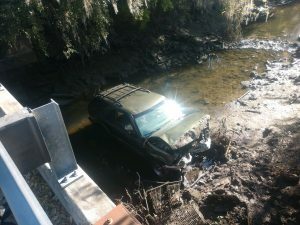 The Savannah Police Department were puzzled as to how the vehicle ended up submerged. and told us they believe foul play was involved. The owner had no idea what happened. He believed his Blazer was stolen. A local, Savannah towing company was needed, so they called us, The Tim’s Towing Company. With Tim’s Towing nearby, they called on us to hoist the Blazer out of the canal and navigate around the fish and wildlife. It was a clean tow and recovery. There was no impact on the local habitat as no toxic oils or fluids were released. We used a rotator to extract the Blazer. We then towed the car to the junkyard with a flatbed trailer. Crazy Damage. 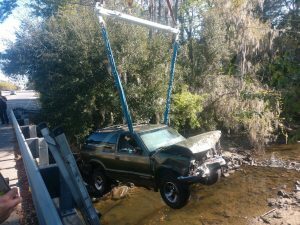 Blazer in Springfield Canal in Savannah before the recovery and tow.